MacOptimizeris a Mac App developed by MacAppware. You can use this helpful app to “trim the fat” on your Mac. Supported processes include monitoring your CPU usage, repairing disk permissions, cleaning out your system and font caches, and much more! 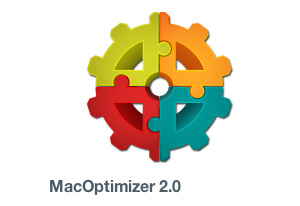 MacOptimizer™ boasts an extremely user-friendly interface. This app feels like a survey blended with a tutorial, and has tons of “plainspeak” to help you understand what it is you are actually doing. The optimization menu runs the gamut from obvious stuff like repairing disk permissions and forcing the trash can to empty to more esoteric stuff like cleaning up the “Open with…” dialogue and rebuilding the Spotlight index. 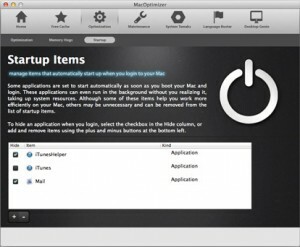 At startup, this app provides you with four main data points about your hard drive. These stats include your hard drive size, used space, available space, and total amount of space recovered by using MacOptimizer. One cool thing that MacOptimizer™ does is the “language buster.” This tool allows you to ditch unnecessary language files that are just taking up space on your hard drive. Even if you’re a multilingual person, you don’t need ALL of the language sets that you have on your Mac. I love being able to see, in terms of MB, exactly how much of a difference that this app makes. The interface is gorgeous, straightforward, and never laden down with jargon. Whether you are actively trying to get your Mac to run better or just trying to maximize your hard drive space, this wonderful app really is a simple and enjoyable way to tidy up your Apple computer. I rarely am this enthusiastic about a pay-to-play app. However, in this case, $29 seems like quite the bargain for such a robust, user-friendly, and effective Mac tool. 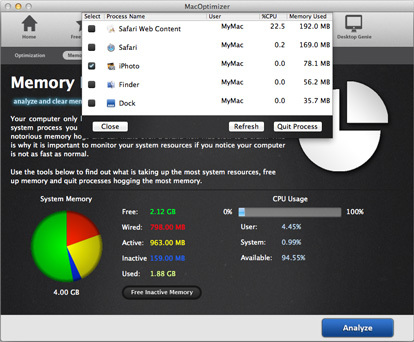 Download MacOptimizer™from the Mac App Store.